Cream cheese or a dot of honey or maple syrup are a way of getting fruit to “stick” to stick and make them sweet with minimal sugar. Serve them on a large platter with as many colors of sliced or chopped fruit as possible. Make them within an hour of serving or the crackers will get soggy. 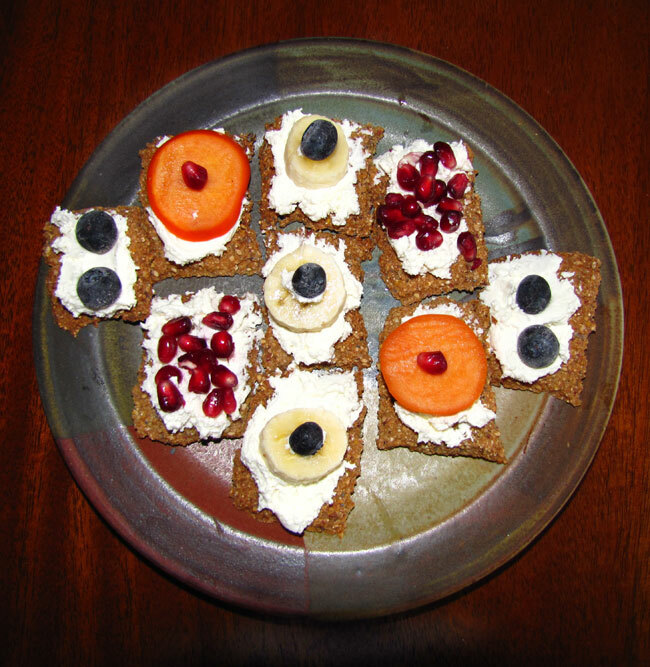 This is a great brunch or appetizer, or way to get your kids to eat more fruit and whole grains, nuts, seeds, and legumes — it doesn’t matter what the cracker is made from underneath since the fruit flavor will dominate the flavor with the cracker providing a nice contrasting crunch. This entry was posted in Chips & Crackers, Sweet Cracker Recipes. Bookmark the permalink.